Term of Service: Enlisted in Company G, 79th Pa, on 10/3/1861. Promoted to 1st Sgt., 2nd Lt, dates unknown. 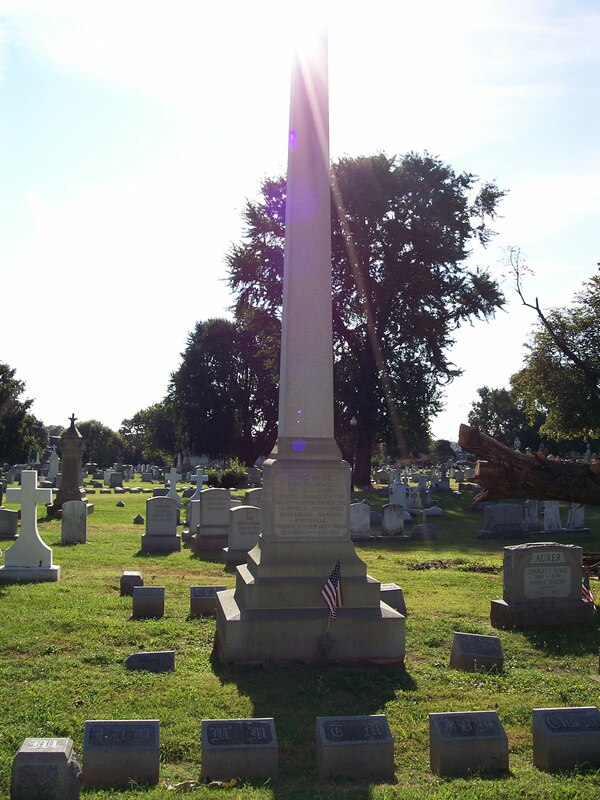 Yesterday, blog reader Glenn Benner contacted me to let me know that he had documented the grave of Lieut. Henry Ransing of Company G, 79th PA, on Find a Grave. Not knowing anything about Ransing, I entered his name as a Google search and was surprised to see his presentation sword scheduled for auction today by Heritage Auctions (it sold for almost $6,000). CAPT. 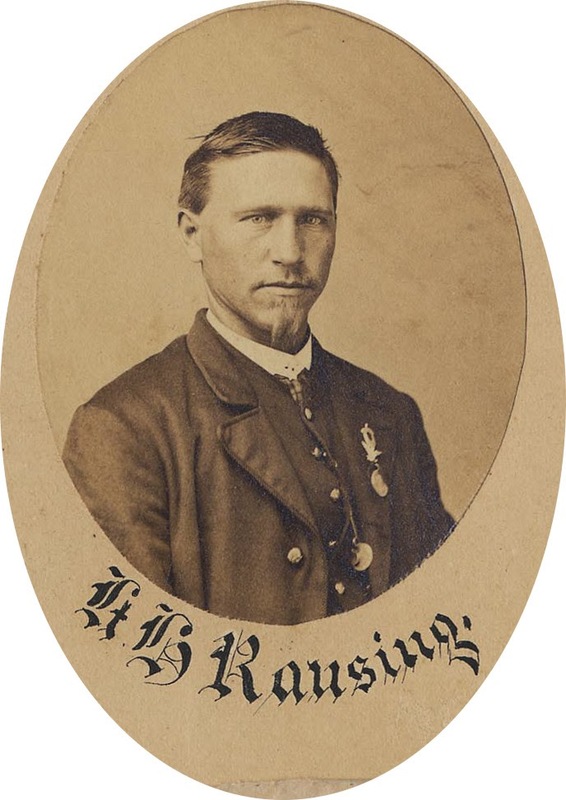 HENRY RANSING (deceased) was a son of George Hiram Ransing, who died in Holland, and whose widow came to the United States when Henry was a lad of two years of age. She became the owner of the land between East Orange, Plum, Marion and Center streets, and this land she sold little by little as the march of improvement took its course in that direction. Henry Ransing was educated in the Lancaster public schools, and at the age of thirteen years entered a cotton mill, where he worked until the breaking out of the Rebellion. At that time he enlisted as a private in Co. G, 79th P. V. I., and at the end of his first term of enlistment, he re-enlisted for the war. He rose rapidly and presently attained the rank of captain. When the company came back in which he first enlisted, he was its captain, though only nine of the original members survived the dangers of war. He was in twenty-seven battles and eighteen skirmishes in the Western Army, but was never wounded. though at the battle of Bentonville his clothing was perforated by sixteen bullets. After the war Capt. Ransing was presented by the members of his company with a magnificent sword, sash, belt and epaulets, the sword bearing this inscription: "Presented to Capt. Ransing by the members of Company G, 79th regiment of Pennsylvania Veteran Volunteer Infantry, as a token of respect and friendship; and for the gallantry displayed in all the battles in which he participated." Capt. Ransing was a member of the Committee on the Monument to the memory of the men of the 79th P. V. I, who fell at Chickamauga. IN MEMORY OF A GALLANT SOLDIER. We mourn. but we comfort feel. When of our friend we're thinking. He died brave and unshrinking. He feared not death: Why should he fear? Feared not the bloody battle! Rose with his comrade's cheers. Their deep love thus revealing. The war was o'er. His sword was sheathed. Beloved by all his brothers. In lending help to others. His soul's at rest; his battle's done. No braver man e'er met a foe. Capt. Ransing was married in 1866, to Rose Roth, who survives him, as does his only son, Henry Edward. The latter was born Sept. 16, 1877, and after securing a partial education in St. Anthony's parochial school, finished his education in Franklin and Marshall College, but was compelled to leave school before graduation that he might assist his father, who became seriously ill three years before his death. Henry E. Ransing has since succeeded to the hotel business. He was married Sept. 20, 1900. Capt. Ransing was a devout Catholic, having taken his first communion at old St. Mary's Church when twelve years old. In his later years he was associated with St. Anthony's Church. He was the founder of St. Michael's Catholic Benevolent Society, and was chief marshal of the great parades that attended the laying of the corner stone of St. Anthony's Church, at the dedication of St. Anthony's Institute, and at other notable Catholic occasions in this city, besides leading his society frequently to other cities to participate in prominent events. Few men indeed were better known in Lancaster than Capt. Henry Ransing, and none more esteemed. 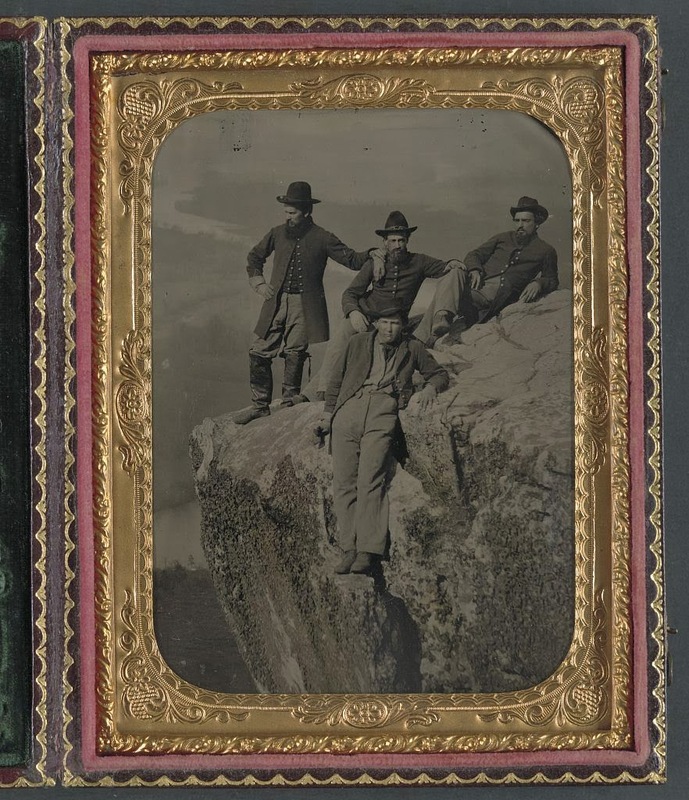 While Civil War soldiers' private letters are a scarce resource that we treasure for the factual details and the opinions that they contain, even rarer are letters to Civil War soldiers from family members. I am aware of very few in Lancaster: one to William T. Clark of the 79th PA from his father just before returning home to try to recruit a company during the Gettysburg Campaign (LancasterHistory.org collection) and one to 1863 militiaman William H. Torr just before Gettysburg (in my collection and likely the subject of a future post). In this post, I will transcribe and comment on another such letter related to several individuals from Pine Grove, Schuylkill County, with an important connection to Lancaster's Civil War history. The recipient was Lieut. Peter A. Filbert, 10th Pennsylvania Infantry, and the writers were his sister Rebecca and her husband Rev. Frederick W. Conrad -- whom you might recognize as the ardent abolitionist/unionist who was pastor of Holy Trinity Lutheran Church in Lancaster between 1862 and 1864 (see post). Believe it or not, I stumbled across this letter when it was sold on Ebay for $270 in 2006. For family details, see their biographies on pages 321-323 of The History of Schuylkill County, Pa. Filbert's diary, letters, and photographs are part of the Harrisburg Civil War Roundtable Collection at USAHEC in Carlisle, and were apparently the subject of master's thesis by Kurt Emerich at Penn State Harrisburg. 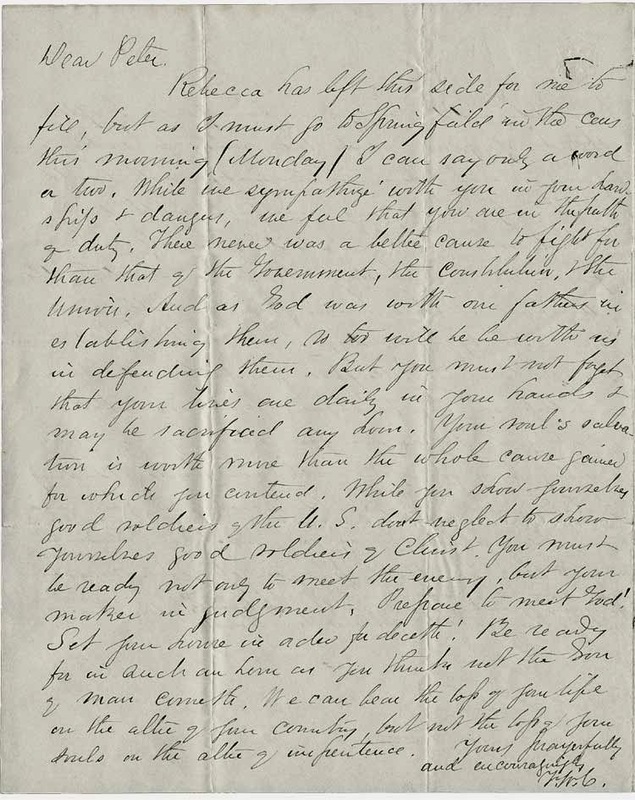 The letter was written six weeks after the war's outbreak. The Rev. and Mrs. Conrad were in Dayton, Ohio, where he had been pastor of First Lutheran Church since 1855. Lieut. Filbert was at Camp Slifer near Chambersburg helping to lead Company D, 10th Pennsylvania Infantry, which he had joined on April 23. News was just spreading of the shooting of Col. Ellsworth. The first three of the letter's four pages were a letter from Rebecca to her brother. She expresses her concern for him, reacts to Col. Ellsworth's murder, and provides an update on her status. I have added paragraph breaks to enhance readability. See the original here. Your very welcome letter was received on friday the 24th, and read in a great hurry, as I was very anxious to know where you were, and how you are getting along. I am much relieved to hear that you are so well satisfied that you are in the path of duty, and hope that you will ever be faithful to your God and country. Remember that a Sister's heart beats in this bosom, and that a Sister's prayers ascend to the Throne of Grace for your protection and success in your effort for the once happy union. God grant that the seceding States may see their error before it is too late. This morning brings the sad tidings of the murder of Col. Ellsworth. He had hauled down the Secession flag from the market house in Alexandra and with flag in hand was shot by a concealed foe. If that be Southern chivalry, let it be added to the dastardly assaults of the Baltimore mob, and pray that the North may never be guilty of so mean an act. The unsettled state of our Country has changed my arrangements for the present. I am anxious to go home if Mr Conrad can make up his mind that it is best for me at present he seems inclined to think that it will be best for me to remain here. I wish I could be where I could add to your comfort. I often think of you, and the many privations you must have in camp, and would willingly share my comforts with you. Mr. Conrad has treated himself with a fine Horse, Phaeton Harness and Sadle which makes him feel a little more as in bygone days. We call the horse Bonnie. I will leave a little space for Mr. Conrad. Farewell God bless you. Be faithful. Write soon. Tell me what your hopes are for eternity so that I may pray for you with an understanding heart, and if I should never see you again in this world may we meet in heaven is the heartfelt prayer of your anxious Sister R.
I am much obliged for the Photograph and if I do not go home shall ask them to send it. Much love to William from us, and tell him we would like to hear from him soon. Write whenever you can. We are very anxious about you. Many hopes and much love from your affectionate Sister Rebecca. The part about the new horse is actually somewhat funny, as it would tie in to the Intelligencer's unfriendly characterization in 1870 of his time in Lancaster: "His penchant for preaching political sermons, a la Beecher, and driving fast horses, a la [Robert] Bonner, soon disgusted the greater portion of his congregation, and would have disgusted all of them, had it not been for the angry passions stirred up by the great rebellion." Pastor Conrad followed his wife's comments with his own one-page pastoral exhortation for his brother-in-law. Rebecca has left his side for me to fill, but as I must go to Springfield in the cars his morning (Monday) I can say only a word or two. While we sympathize with you in your hardship and danger, we feel that you are in the path of duty. There never was a better cause to fight for than that of the Government, the Constitution, the Union. And as God was with our fathers in establishing them, so too will he be with us in defending them. But you must not forget that your lives are daily in your hands and may be sacrificed any hour. Your soul's salvation is worth more than the whole cause gained for which you entered. While you show yourselves good soldiers of the U.S. don't neglect to show yourselves good soldiers of Christ. You must be ready not only to meet the enemy, but your maker in judgment. Prepare to meet God! Set your house in order for death! Be ready for in such an hour as you think not the Son of man cometh. We can bear the loss of your life on the altar of your country, but not the loss of your souls on the altar of impenitence. Yours prayerfully and encouragingly, F. W. C.
While it may seem that the Civil War has been studied from virtually every angle, one important but largely missing perspective is the experience of religious communities such as churches and synagogues on the local level. Over the past ten years, I've thoroughly enjoyed researching Holy Trinity Lutheran Church (see here) -- one of Lancaster's more physically and historically prominent churches -- and have been lucky in the abundant high-quality primary source material that I have been able to glean. This has better enabled me to better understand the war's effect on individuals at the local level, as well as take historical persons more seriously (sometimes a problem in Civil War studies) due to our shared institutional connection. Since earlier this year, I've even been working with members of First Lutheran Church in Pittsburgh (the one at the base of the US Steel Building) to reproduce this line of research inquiries and see what we find. A comparative lack of newspaper primary sources and turn-of-the-century industrial biographies for First Lutheran Church and Pittsburgh vs. Holy Trinity and Lancaster has made us turn to (1) published sources related to famous pastors Passavant and Krauth and (2) church records as staring points. Studying church records prompted me to go back and do something during a recent weekend in Lancaster that I had not done before (at least not comprehensively): examine Holy Trinity's baptism, marriage, and burial records. In this post, I'll give some thoughts based on my preliminary scan of these records. I'll start by saying that it's rather jarring to someone with your last name (Schlauch, or its many Anglicized forms such as Slough and Slaugh) and connected to the same church listed as "one of the largest chattel-holders of the county" with eleven slaves. It turns out that there's no perceptible genealogical relationship, as my Schlauch line only came from Germany to Lancaster in 1871 (Andreas Schlauch, from Baden Baden), but the somewhat surprising fact remains that some of Lancaster's and Holy Trinity's leaders in the mid-1700s owned African Americans as slaves. Ebersole describes this essentially as a adaptation by select Germans of a more largely English practice. While it may not have had the industrial scale of later forms of slavery in the cotton South, slavery in Lancaster still evidently involved the separation of families for profit and slaves and a system that some slaves tried to flee. Clearly, it's a complex subject with a range of primary and secondary sources that I still need to study. At Holy Trinity in the late 1700s and early 1800s, free and enslaved African Americans had some level of participation in church life through baptism, marriage, and burial (hence, the helpfulness of church records). In the years after emancipation began as a gradual process in 1780, laymen and pastors of Holy Trinity supported the founding of African-American churches in Lancaster and later joined the Africa colonization movement. Despite giving some prominent examples of slaveholders, Ebersole writes that "for the most part, the Moravian, Reformed, and Lutheran churchmen also stayed aloof from the English culture, and from all slavery practices, upon their arrival in the New World." It will be interesting in future research to identify differences in opinion between members of the congregation, as well as the German-born Rev. Gottlob F. Krotel and the Pennsylvania-born Rev. F. W. Conrad, Furthermore, what can we infer from the exclusion of African-Americans at Trinity-connected Woodward Hill Cemetery, or from the Ladies' Kansas Relief Meeting at Holy Trinity that so irked the Democratic Intelligencer (12/4/1860)? I don't recognize too many family connections between the mid-1700s slaveholders and those active with Holy Trinity in the Civil War Era, with one exception: records exist of George Hopson Krug's grandfather Valentine Krug leaving slaves to George's father Jacob in his will. The Krug family was known for its tannery, and George H. Krug was an important lay leader at Holy Trinity until his death in 1869. 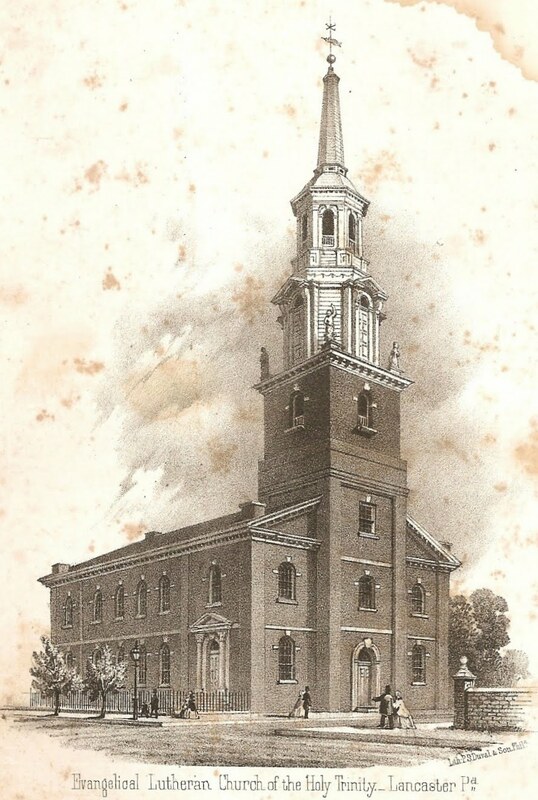 At Holy Trinity in 1842, Krug's daughter, Rebecca, married a young Navy officer named William Reynolds, whose father was in the same Democratic Lancaster social circles (think James Buchanan) as Rebecca's father. William went on to lead a remarkable career in the Navy, and his younger brother John Fulton Reynolds achieved even greater fame as a general in the Army of the Potomac. Elmer Ellsworth Filler (b. 4/19/1861), son of Henry and Juliana Filler (sponsor). Elmer Ellsworth Shreiner (b. 6/15/1861), son of Henry Michael and Mary Shreiner (sponsor). Ellsworth Leibley (b. 6/20/1861), son of Jacob and Elizabeth Leibley (sponsor). Elmer Ellsworth Winour (b. 7/15/1861), son of George Washington and Fanny Winour. Sponsored by Amelia Sensendorfer. Charles Ellsworth Peterman (b. 8/2/1861), son of George and Frances Peterman (sponsor). Ellmer Ellsworth Steigerwalt (b. 9/5/1861), son of Michael F. and Martha Steigerwalt (sponsored by both parents). Charles Ellsworth Bowman (b. 9/23/1861), son of William and Catherine Bowman (sponsor). Ellsworth Holtz (b. 8/9/1862), son of George Washington and Mary Ann Holtz (sponsored by both parents). Edward Elmer Ellsworth Cogley (b. 12/13/1861), son of Joseph and Sarah Ann Cogley (sponsored by grandmother). George B. McClellan Killian (b. 4/18/1863), son of Henry K. and Pricilla Killian (sponsored by both parents). I wonder how ardent abolitionist F. W. Conrad felt baptizing this child. Abraham Lincoln Mishler (b. 11/9/1865), son of Isaac and Catherine Mishler. Sponsored by mother. At least two children were also named after the Rev. 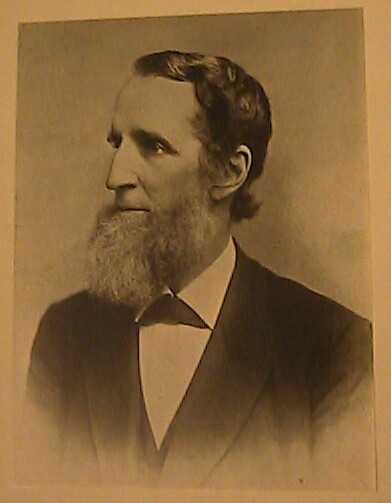 Dr. Gottlob "George" F. Krotel, who had earned the admiration of much of the congregation before his departure to Philadelphia in 1861. George Krotel Bender (b. 8/17/1861), son of Benjamin S. and Hetty Bender (sponsor). George Frederick Krotel Erisman (b. 2/23/1863), son of Emanuel J. and Mary Erisman (sponsor not listed). Capt. Jacob Gompf: Jacob Augustus (b. 10/14/1860) baptized 3/14/1861 with mother Susan as sponsor. James P. Dysart (brother of 79th PA captains): Henry Scherff (b. 11/26/1860) baptized 4/18/1861). Sponsored by grandparents Mr. and Mrs. Henry Scherff. Capt. Edward Edgerly: Edward Everett Edgerly (b. 9/3/1859). Son of Edward and Rosanna Edgerly. Sponsored by grandparents John and Rosanna Stehman. Lieut. William P. Leonard. Three children with wife Harriet baptized on 6/10/1867. Daughter Emma Virginia (b. 6/24/1846) baptized on July 15, 1846. William F. Dostman (b. 10/8/1841), son of John Peter and Catherine Dostman (sponsor). Horace Binney Vondersmith (b. 5/6/1844), son of Daniel B. and Clara Elizabeth Vondersmith. Both parents sponsored. Robert M. Dysart and Lyman G. Bodie: both listed in death records for mid/late-1860s which I did not copy. 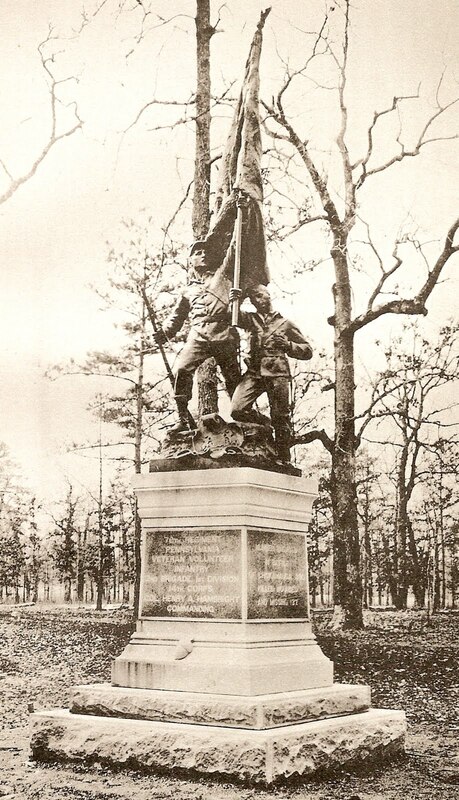 Note that Dostman and Vondersmith are the color bearers depicted in the 79th Pennsylvania's Chickamauga monument. In the battle, Dostman was fatally wounded by an exploding shell and Vondersmith carried the flag forward. As an aside, Vondersmith's father, Daniel B. Vondersmith, had become infamous during the 1850s when he fled the United States on charges of fraud in a pension forging scheme. He later returned to serve jail time before being pardoned. Later in life, he could be found as the cashier for a traveling circus. His son, meanwhile, earned a sterling reputation as Lancaster's fire chief. I'll have to document the lives of the father and son Vondersmith in a future post. Oliver J. Dickey (Republican politician): Mary Elvira (b. 9/10/1858) baptized 11/10/1860. Sponsored by mother Elizabeth. Rebecca Reynolds Krug (b. 6/23/1861), daughter of John H. and Henrietta Krug. Named after her aunt, wife of future Admiral William Reynolds. Baptized 8/12/1861. Sponsored by grandfather George H. Krug. Rebecca Reynolds Krug and Rebecca Krug Reynolds seemed to have a mother-daughter relationship (see latter's obituary). Emlen Franklin (Col., 122nd PA): Emlen Augustus (b. 2/23/1864) baptized on 12/3/1865, son of Emlen and Clara Amelia Franklin. Both parents were sponsors. George Unkle (correspondent and Pvt., 9th PA Cavalry): Ann Elizabeth Unkel (b. 2/11/1845), daughter of George and Ann Adelaid Unkle. One thing that stuck out is approximately one-third to one-half of the baptisms only seem to have the mother as the sponsor. What does this say about church membership and gender roles? Is this specific to Holy Trinity or to Lutherans? Was there a lost generation of men in churches in the mid-1800s? Were maternal lines more important in determining a family's religious life? Or is there some other reason to explain the trend? I'll have to pay attention to these questions as I look at other churches' records and dig up Lutheran newspapers to see if any editorialists comment on a trend. I'm glad I finally took the time to flip through Holy Trinity's records. It's given a few interesting data points to help characterize the Union cause and will help to fill in some holes about 79th Pa personalities. I haven't even touched on the weightier themes of the interplay between competing Lutheran ideologies and competing national ideologies regarding the Lutheran identity, race, patriotism, and church life. Look for a future posts with a more biographical focus on members of Holy Trinity to enhance our capacity to imagine and study how the war affected communities and individuals. Capt. Samuel J. Boone, Company C. Killed in action. Buried at Middle Octorara Presbyterian Church Cemetery, Quarryville. Lieut. Henry J. Test, Company C. Killed in action. Presumably buried in York. Pvt. William Eckert [Eakert], Company B. Killed in action. Buried at Calvary Monument Bible Church Cemetery, Paradise. The rest of the men killed in action were buried on the field by their comrades -- despite the wishes of many family members in Lancaster to have remains sent home. Those remains, which did not retain any identification, were transferred to Camp Nelson National Cemetery after the war. Others who died in military hospitals are buried in national cemeteries around Louisville. Two years ago, I went out to visit and photograph the graves of Capt. Boone and Pvt. Eckert, which are only a couple miles apart in southern Lancaster County. In posts over the upcoming days, I'll post more about their lives and deaths and share some photos of their tombstones. 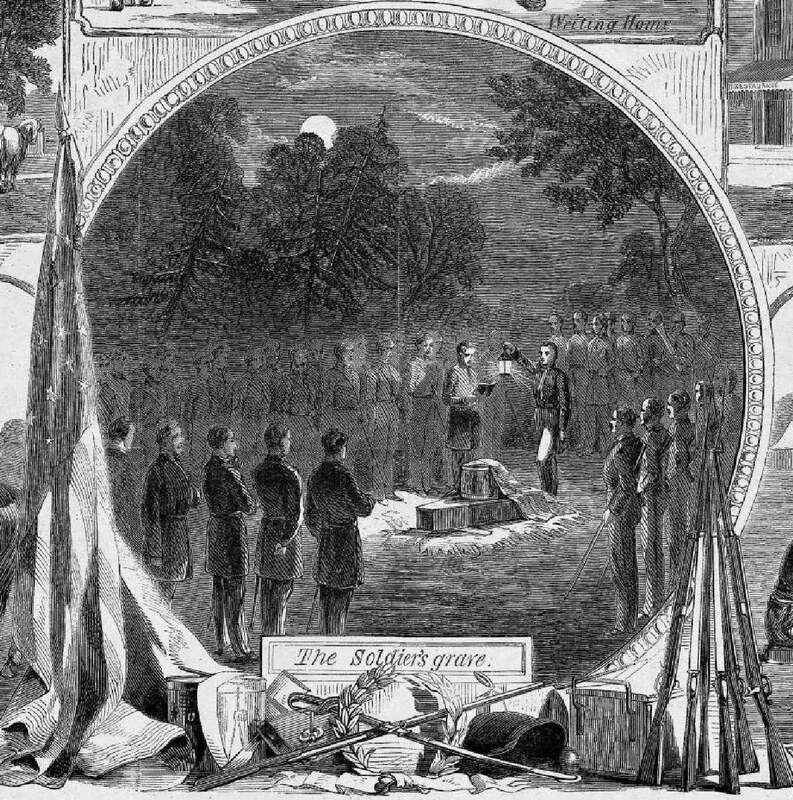 Over at Civil War Memory, Kevin Levin comments on a recent article, "The Great Exaggeration: Death and the Civil War," by Nicholas Marshall in the Journal of Civil War History. Marshall reappraises the significance of the Civil War death toll, arguing that it wasn't all that different from death before and after the war. After reading the article, I have major issues with the statistical framework used in his analysis and found the assertion that one single statistic (i.e., number of deaths) does not give a full picture of societal ramifications to be somewhat obvious. Furthermore, it was jarring to see assertions like "dying of disease in a camp must have seemed distressingly normal" [p. 16] appearing in an academic publications without any evidence or exploration. I was going to comment on Kevin's blog, but instead will use this post to give some thoughts on the topic and connect them to Lancaster and the 79th Pennsylvania. The article's main argument is that the variability of the death rate was not all that different from pre-war levels. Unfortunately, the author has no sense of the very important relationship between population size and the variability of the death rate. Of course the variability of the death rate will be higher for smaller cities and very low nationally -- the variability of the death rate should decrease with population size. Raw annual changes in the percentage of people who die mean nothing if you're not comparing populations of similar size, and Marshall is comparing that of single cities or states with changes in the national rate. He should have known that something funny was going on when the death rate in Chicago jumped by 300% one year. He also claims that drops in the male survival rate for the 1860s decade was not significant because, well, it's still within the range of 1/4 and 1/5 -- whatever that means [p. 12]. [Interesting side note: did the female death rate during childbirth increase during the 1860s due to war's claim on medical resources?] We have measures of statistical significance for a reason -- just because you're writing history doesn't mean that you shouldn't use them! Even within this "change in death rate" framework, there are two other problems: (1) the high casualty rate lasted for three or four consecutive years and was not just a one-year fluke; and (2) although the war spanned four years, combat casualties were concentrated over three years. For Lancaster, it was really 2 years and 9 months (Seven Days Battles in June 1862 though Battle of Bentonville in March 1865). This would make the spike in the death rate look more dramatic, and possibly better point out the scope and scale of the war's trauma. By the way, I never placed too much stock in the whole "if the death rate was extrapolated to today's population..." meme as a teaching tool; I think the stats speak for themselves. For example, Lancaster County had a population of 116,000 according to the 1860 census. From my knowledge of Pennsylvania volunteer companies recruited in Lancaster, I'd guess around 10,000 men served as soldiers and approximately 1,500 died. The 79th Pennsylvania (9 out of 10 companies from Lancaster) accounts for 268 of those deaths -- which I believe to be reasonably accurate based on reviewing rosters -- according to Dyer (1908). Having these numbers on a county level seems to give better intuition about how death affected a community than national statistics. The point is that Chamberlain relied on an English poet's words about the death of a soldier with the French Foreign Legion in Algiers to make some sense of Rudy's death. A comprehensive look at how the literary and artistic tools for confronting death before the war transferred to the war could be very interesting, if not already done. In particular, I always pay special attention to wartime tombstones in cemeteries as they often offer an artistic richness that shows how people dealt with death during the war, and am curious to know more about that subject. A comparison of different religious newspapers and the ideas (or lack thereof) from religious thought leaders could be particularly illuminating. However, the poem and the topic of cemeteries point to a way in which death was experienced very differently during the Civil War. Namely, there was no body to bring home to bury. Considering Company E, 79th Pennsylvania, how many bodies of the 26 soldiers who died during the war were brought back to Lancaster? As far as I know, zero. Almost all are in military cemeteries from Louisville to Nashville to Chattanooga to Atlanta to Andersonville to Bentonville, and some even suffered unknown fates on the battlefield and presumed dead. As evidenced by its prominence as a topic in almost every letter after the Battle of Perryville, the inability to bring bodies home for burial significantly frustrated pre-war death rituals. In response, more public forms of commemoration in Lancaster (e.g., Soldiers and Sailors Memorial in Lancaster, erected 1874) and more national ideas about death and sacrifice took hold. This is basically the premise of the PBS documentary from last year, I believe. So, with some knowledge of statistics and the social mechanics of death in one particular Northern community, I find Marshall's characterization of recent scholarship on death and the Civil War as built on a "great exaggeration" to be unconvincing. Although there are many interesting questions on this subject left to explore regarding the broader context of death in that era, I estimate current scholarship to be more or less on the right track. On the evening of March 5, 1864, any soldiers of the 79th Pennsylvania who reenlisted as veterans were relieved of picket duty near Tyner's Station, about ten miles east of Chattanooga. Early the next morning, they left camp and marched to Chattanooga, where they waited for a day before boarding a train for Loiusville. The journey to Louisville took three days, and the 79th Pennsylvania passed many regiments that had just completed their furlough and were heading in the opposite direction. The regiment arrived in Pittsburgh on the night of March 13, and were treated to splendid supper before boarding another train for an overnight journey east. March 14 was spent completing to journey to Harrisburg, where the regiment spent a day preparing for their return to Lancaster by tending to some long overdue personal grooming. Although the food in Harrisburg was worse than what they got on the front lines, the state legislature acknowledged the regiment's presence by unanimously passing resolutions offered by State Senator Benjamin Champneys of Lancaster. 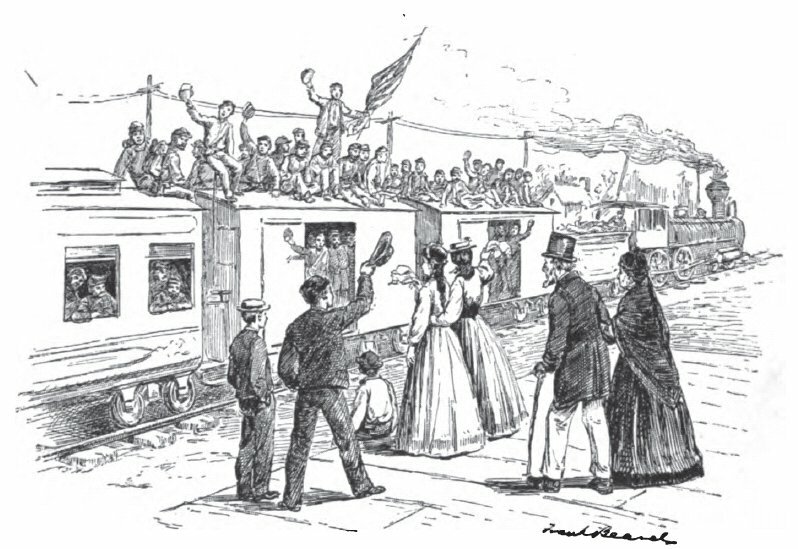 Upon their arrival [at Dillerville], the veterans were met and welcomed by an immense crowd of their fellow citizens, and the streets through which they passed were thronged with men, women, and children. The display of bunting was magnificent, and reminded us of the patriotic uprising in 1861, when the demand for flags could not be supplied. The Reception was altogether a magnificent affair, and the veterans after what they witnessed that day can have no doubt of how deeply the People sympathizes with the gallant defenders of the flag of the free. The officers and men of the 79th looked like veterans as they are. Their soldierly deportment in marching was noticed by every spectator. There was not as much noisy enthusiasm as many expected to witness. the regiment is under strict military discipline, and of course the men received all greetings with the dignity of military silence. The general joy at welcoming home the gallant survivors was mingled with sadness at the memory of the lamented dead. Many once familiar faces were missed from the veteran ranks; and as the torn colors of the regiment passed along, riddled by the deadly missiles of many a battle, we saw the tear start to eyes unused to weep. At Fulton Hall, five long tables that stretched the hall greeted the veterans. Dr. Henry Carpenter gave a greeting and Rev. F. W. Conrad of Trinity Lutheran Church gave a prayer before Mayor George Sanderson gave a lengthy welcome speech. Private Edwin K. Martin of Company E, 79th Pennsylvania gave a response on behalf of the regiment, and collation concluded with music by the Fencibles Band and the Glee Club. Took train at apptd. time, met committee on reception at Dillersville (one mile north of Lancaster). We disembarked, marched, halted, Artillery firing as salute to us. Procession formed at 10½ A.M. lead by (our former Lieut. 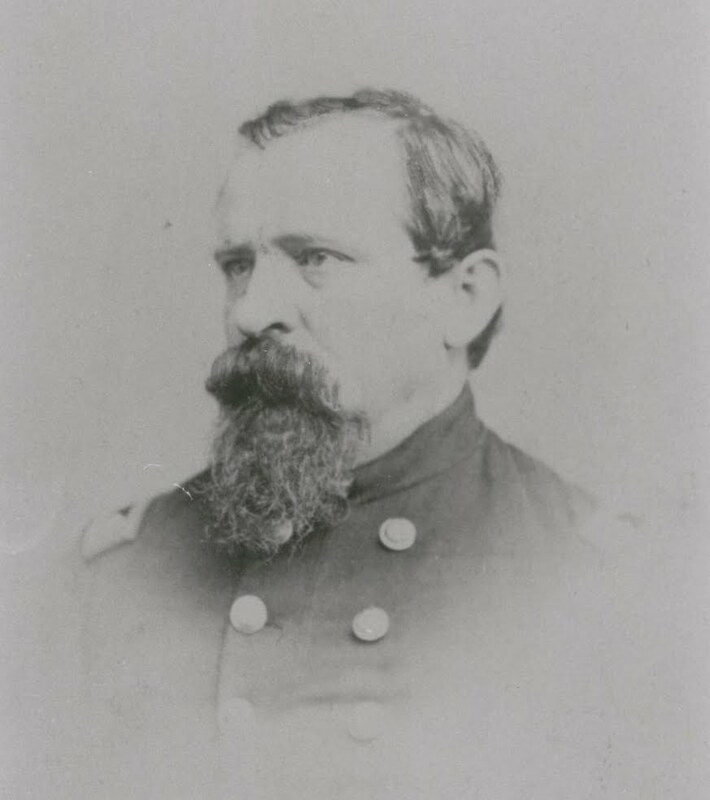 Col.) John H. Duchman. Copperheads following their Copperhead leader. Marched through the different streets of town. Saw many friends. Stacked arms in front of Fulton Hall. Were marched in where a fine collation was spread. This has been done by deception on the part of Copperheads, only a few Patriot Daughters being among them. The Hon. Copperhead Mayor of Lancaster made a speech of welcome which greatly belies his former actions toward all soldiers. Col. H. A. Hambright made a few remarks excusing himself by saying he never made a speech. Ed Martin responded in behalf of the 79th P.V.V. in a splendid speech cutting Copperheads & all others leagued with Treason right & left. It gave many of them the short coughs & made them generally uneasy. We then ate heartily of the dinner prepared. An hour afterwards we fell in & drilled in Centre Square more than an hour, when we returned to the Hall, marched to the upper story, stacked arms & are given leaves of absence untill the 20th when we must answer to our names & receive our furloughs. For the second time in a week, an interesting transportation-related photograph from Lancaster County appeared on Ebay. First, there was a carte-de-visite of a locomotive built at the Norris Locomotive Works in Lancaster City in 1867, which I wrote about in a post earlier in the week. 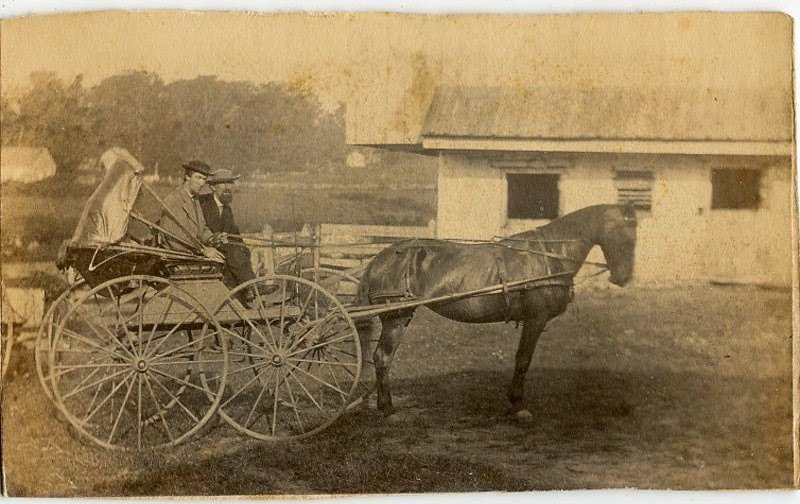 Then, an image of a horse and buggy carrying two men in front of a barn appeared. Fortunately, I was able to purchase both, and I look forward to doing more research about them and using them to tell the story of life in Lancaster County during the 1860s. 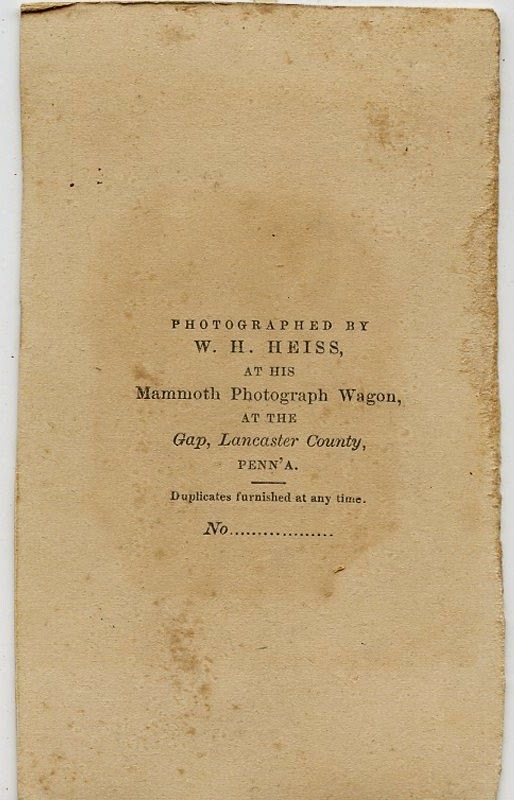 The horse and buggy image was taken by an itinerant photograph named W. H. Heiss, who took pictures at of his "Mammoth Photograph Wagon" in the Lancaster County towns of Strasburg and Gap during the mid-1860s. Because the photograph does not have a tax stamp, it was almost certainly taken before summer 1864 or after summer 1866. A couple of his images pop up on Ebay every year. 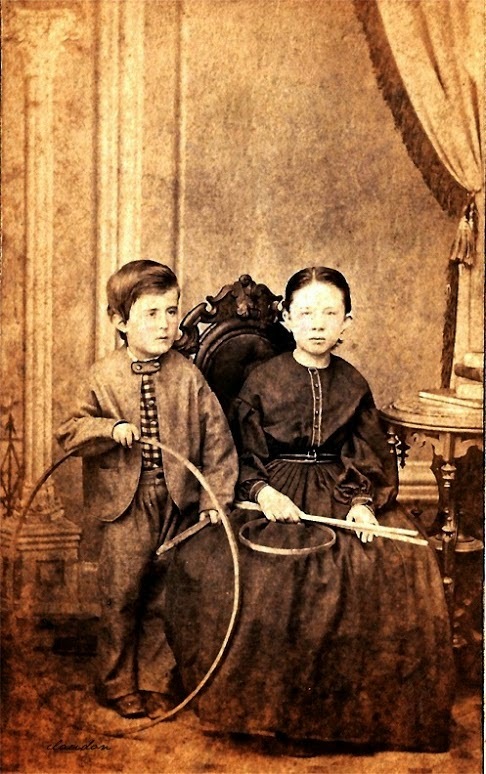 Several that I have seen are of children with the same hoop rolling toy props as seen in the image below. The image is also remarkable simple because it was taken outside. I don't know if I can think of an earlier CDV taken in Lancaster outside of a photography studio, although there were some earlier daguerreotypes of Lancaster and photographer William L. Gill started making stereoviews of outdoor scenes sometime around 1866. Unlike the "Bee" locomotive photo, it's difficult to guess what message the photograph is trying to convey. Is the focus on the horse or the buggy, or both? Where is the farm? Are these Quaker farmers making a show of their prosperity? Where type of buggy is it, and where was it made? And, of course, who are the men in the photo? One of the joys of Civil War research is that any day artifacts can pop up on Ebay and send you on diverse and exciting research paths. Such was the case a couple days ago when a carte-de-visite photograph of a locomotive built in Lancaster showed up in my Ebay searches. The photograph shows a locomotive named "Bee" and has a backmark identifying it as a product of the Norris Locomotive Works, Lancaster, PA. The locomotive's specifications -- "Cylinders, 20-In. Diameter, 26-In. Stroke, Driving Wheels, 48-In. Diameter" -- and the name of John A. Durgin, Constructor, also appear on the back. There is a reference in the Locomotive Engineers Journal of 1870 to the trading of photographs among different shops, so it seems plausible that this photograph was taken to showcase the work being done in Lancaster. "The Norris Locomotive Works, Lancaster, PA."
Prior to the war, the Lancaster Locomotive Works turned out engines from 1853 until it failed during the Panic of 1857 when railroads could not pay for the locomotives that they purchased. 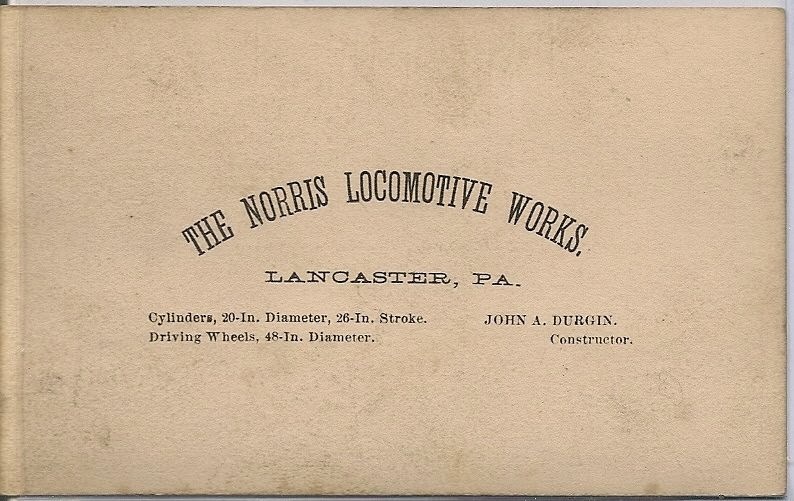 The shops lay idle for several years until two of the Norris brothers connected to the Norris Locomotive Works in Philadelphia moved production to Lancaster in late 1863. The facility was located in the northeastern part of Lancaster City along the railroad on the northeast corner of Plum and Fulton Streets. By June 1865, the works produced one locomotive per week and employed 400 men in Lancaster. A map from 1866 exists in the collections of the Free Library of Philadelphia and shows the facility's six-acre layout with buildings labeled A-L that housed a machine shop, foundry, blacksmith, boiler shop, erecting shop, etc. An article in the June 20, 1866, Intelligencer describes all of these shops in detail. A Lancaster boy, Henry C. Frazer (1850-1903), who apprenticed at the shop between 1865 and 1868 recalled that many of the locomotives produced in 1865 went into service on the Western Pacific Railroad in California (Railway and Locomotive Engineering, May 1902, p. 208). In 1866, John A. Durgin became Constructor and Superintendent, and the first ten-wheeled locomotives were produced in 1867 for the Pennsylvania and the Allegheny Valley Railroads. Lancaster's locomotive works were closed again in October 1868, perhaps testifying to the volatility of industrial growth in the Civil War era. Surely, some of the returning veterans of the 79th Pennsylvania found employment there upon their return from the war in summer 1865. The Bee appears to have gone into service on the Lehigh Valley Railroad and was modified in 1883 to a 2-8-2 configuration. 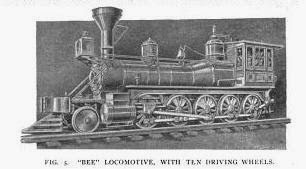 The Bee's novelty attracted attention as railroad engineers reflected on their early days in professional journals in the early 1900s, and engravings from those journals document its appearance over the course of its lifetime. In this post, I republish an exciting account of David Miles' eleven months in Southern prisons that Miles gave to the editors of the Daily Evening Express upon his parole and return to Lancaster. See the full account here, which was published on August 11, 1864. David Miles, the future lieutenant colonel of the 79th Pennsylvania, was born in Franklin County in 1831. By 1860, he had moved to Lancaster's Northwest Ward to work as a tinsmith with wife Mary and four children. Before the war, he was involved with the Lancaster Fencibles militia and apparently also worked to promote Lincoln's election, as William McCaskey mentions Miles as the marshal of "the great Lincoln Mass Meeting" (as a reference point for a type of hat McCaskey wished to have sent from Lancaster, 2/5/1865). Upon the organization of the Lancaster County Regiment, Miles would take the position of first lieutenant of Company B, 79th Pennsylvania. 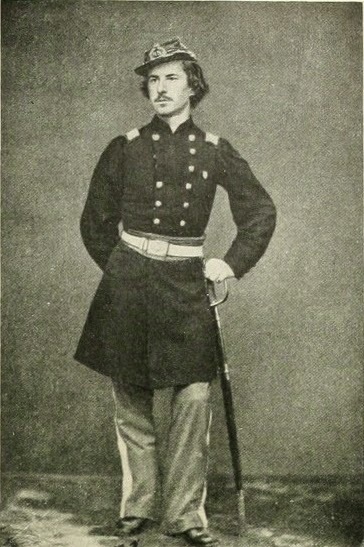 The departures in 1862 of Captains Kendrick, Duchman, and Druckenmiller opened the path for Miles to become lieutenant colonel, and he led the regiment's left wing with distinction at the Battle of Perryville. 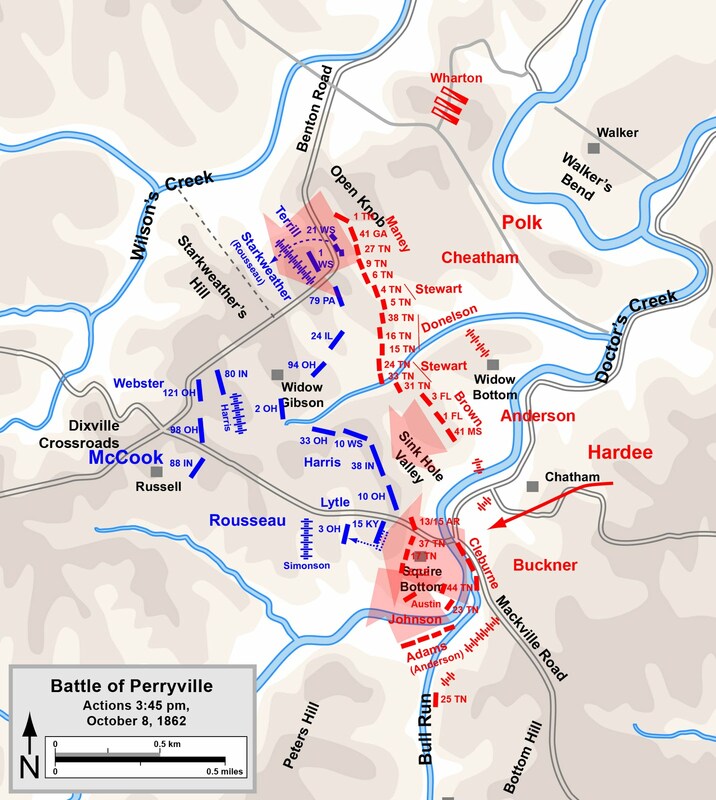 Just after the dark on September 19, 1863 -- the first day of the Battle of Chickamauga -- the 79th Pennsylvania advanced through dense woods to plug a hole in the Union line. Commanding the left wing was Lt. Col. David Miles, who was mounted on horseback after breaking his leg in a fall from his horse back in May. As the Lancaster County Regiment moved forward, a combination of friendly and enemy fire caused the situation to rapidly deteriorate. The line broke and the regiment hastily retreated. The hobbled Miles found himself dismounted in no man's land with his horse's reins in his hands. He lay on the ground to escape the bullets and eventually remounted after finding a stump to stand on. Due to a faulty sense of direction or the shifting battle lines, Miles rode into what he thought were friendly soldiers, only to be surrounded by Confederate soldiers who demanded his surrender. For the next month, his fate was a mystery to the remaining soldiers in the 79th Pa, who feared the worst for him and his family. Capt. William G. Kendrick wrote his wife of the situation, "[Miles'] wife has five children and she is not able to walk and has nothing to live on, a terrible condition to be left in, no life insurance." (10/14/1863, emphasis in original) Miles' self-described protege, Capt. William McCaskey, thought it a good idea for his brother to send his sister on a visit to Mrs. Miles to comfort her, but felt confident that Miles would turn up based on reports of another regiment nearby thinking that they saw him on the night of September 19. 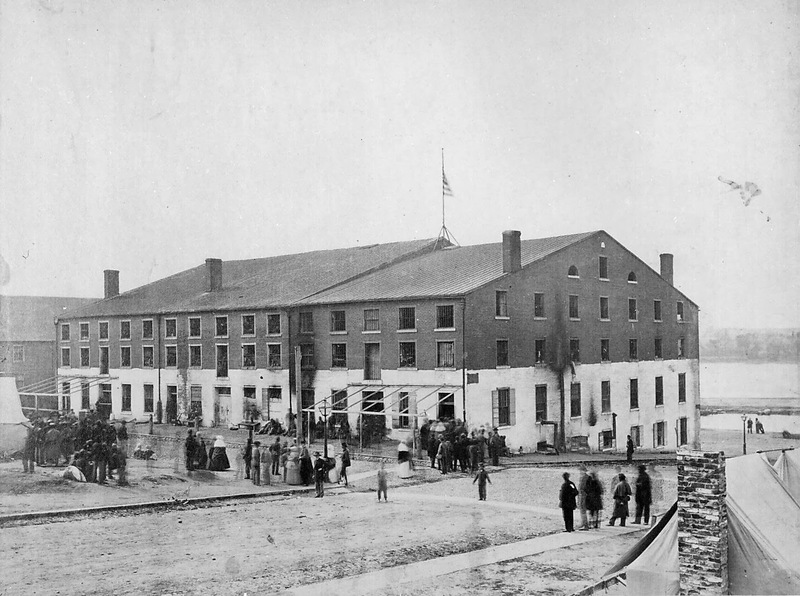 By the time news of Miles' capture reached Lancaster and the 79th Pennsylvania, Miles had already spent two weeks as a resident of Libby Prison in Richmond, Virginia. Immediately after his capture on September 19, the Confederates had him and other prisoners march to a rendezvous point ten miles distant. Fellow captives John Shirk of Company E, 79th Pa, and Lieut. John W. Thomas of the 2nd Ohio Infantry* provided the injured Miles with badly needed shoulders to lean on during this march. Miles and other Union soldiers made a journey by train and arrived at Libby prison -- an old tobacco warehouse -- on September 29, 1863. The escape took place on the night of February 9-10, 1864, after weeks of tunneling by imprisoned Union officers. The total number of prisoners to escape was 109, of whom 59 succeeded in reaching Union lines. Miles joined Captain Hardy of the 79th Illinois and broke east for Union lines. The traveled an estimated 60 miles in a circuitous route, aided by local African Americans. While trying to pass the very last line of Confederate pickets, they were recaptured five days after they escaped. Miles was taken back to Libby prison and was confined in a hole for two days, but was spared further punishment due to his illness and rejoined the general prison population. The next chapter in Miles' prison saga involved getting sent to Charleston, South Carolina, as a human shield, which was an upgrade from prisoner in Richmond as far as Miles was concerned. 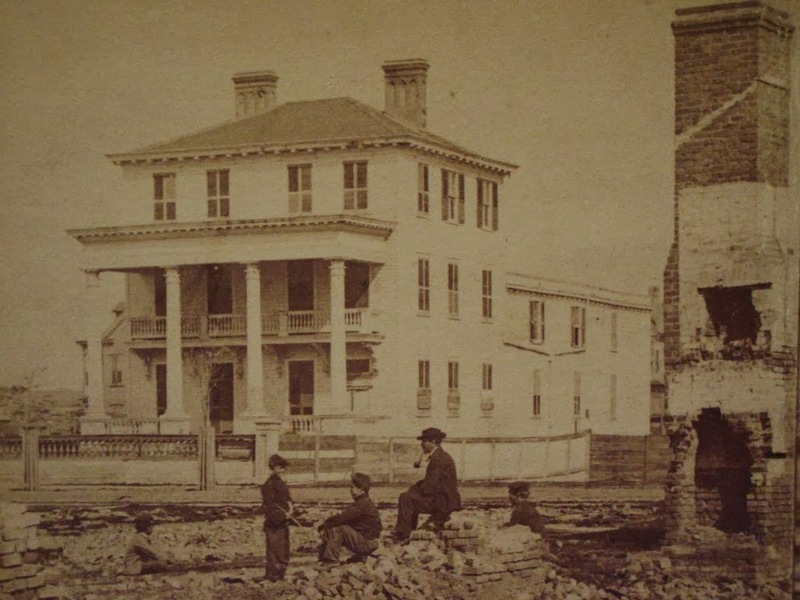 Upset about the bombardment of Charleston by Union forces, the Confederates placed the fifty highest ranking prisoners (which included Miles) in a jail and subsequently a relatively comfortable house in range of the Union shells. Miles claimed not to have felt any great danger but rather enjoyed the ability to purchase from market wagons and even to "play ball and exercise themselves" in a space set aside for that purpose. Eventually, the controversy over the bombardment of Charleston and use of human shields came to a resolution, and a special exception to the no prisoner exchange policy allowed the Union officers in Charleston to be exchanged. Miles arrived home in Lancaster in early August 1864. Besides spending time with the editors of the Express to get a full account that was published on August 11, the Lancaster Fencibles -- his old militia unit -- treated him to a supper on August 18. Miles made a celebrated return to the Lancaster County Regiment on the evening of October 29, 1864. Sgt. William T. Clark reported in his diary, "Lieut. Col. Miles looks very well. Crowds are continually around him, hearing of the suffering of Rebel Prisons." Miles would lead the 79th Pennsylvania or its brigade for most of the rest of the war, most notably commanding a brigade at the Battle of Bentonville, North Carolina, where he was wounded. Overall, he seems to have been a courageous, competent, and highly-esteemed officer. The escape in which he participated gained national attention and provided another welcome positive distraction in what could have been a long winter of 1864 for Northern civilians and soldiers. * Both Shirk and Thomas have their own escape stories. Shirk went off to Danville prison and was part of a similar escape later in February 1864. He left his own account (and is mentioned in an account by John Obreiter of the 77th Pennsylvania), which I will feature in a future post. Thomas successfully reached Union lines in the escape from Libby prison. He was killed in battle on July 20, 1864, near Atlanta. Full account published in Daily Evening Express on August 11, 1864. Once or twice a year, my wife and I have the opportunity to participate in a living history event in which reenactors partner with a historical site to interpret a specific historical event. My wife savors the opportunity to assemble a high-quality wardrobe, and I generally enjoy doing some of the background research about a particular person, place, and time. 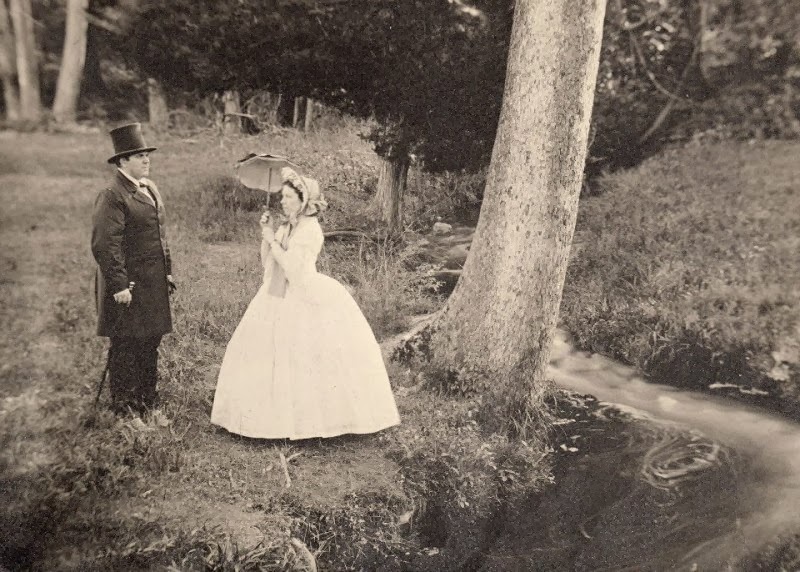 Neither of us are big fans of "first-person" portrayals where we pretend to be a person in the 1860s, but we're happy to do it if it enables us to do something special with costumes, material culture, biography, and history. Emancipation as a moral imperative. Instead of talking about emancipation as a military necessity, the possibility of an antislavery amendment brought moral arguments against slavery into pages of the Daily Evening Express, a Republican newspaper. The Express ran an essay entitled "The Demon of Slavery" by Henry Ward Beecher on its front page, and editorialized that the war's objective was now "the merciless mandated, 'Slavery must die!'" Among Lancaster's mainstream Republican community, emancipation was pretty much an afterthought in the rush to war, and then really came up in the context of confusing policy situations in which military found itself in 1862. By 1864, we see that ending slavery went hand-in-hand with winning the war. Details from the Battles of Wilderness and Spotsylvania. Initial reports had indicated a victory with heavy losses in these first meetings between Grant and Lee, with more clashes expected. More local news -- casualty lists from the Lancaster companies and accounts of the Pennsylvania Reserves in battle -- began to trickle in a couple days after the national news. The five Pennsylvania Reserves companies or two 45th Pennsylvania companies suffered moderate casualties. Soldiers fairs. News about local soldiers fairs and support for an upcoming fair in Philadelphia filled newspapers for much of the first half of 1864. In addition to raising the morale of and materially aiding local soldiers, they seem to have served to re-energize the Northern populace and provided a welcome distraction as the war dragged on. Inflation and prices. Trade organizations for hotel keepers and shoemakers made attempts to publish suggested prices as the war raised prices of materials. Veterans home on furlough. Most had already come home and were back in the field, but a few had their furlough in May. Company G, 9th Pennsylvania Cavalry, was home during this time. Sadly, one of its veterans was killed when jumping off a train at Elizabethtown. Administration of veterans' bounties. Veterans who reenlisted were promised bounties from municipalities (that received credit for their reenlistment against their draft quota). Families were slow to receive that money, much to the indignation of soldiers who wrote letters of protest. Preparing for the election of 1864. Newspaper editors talked about the Virginia campaigns and military strategy in the context of campaign strategy. The Union Party (Lincoln's party) would have its convention in the first week of June. With its editorial, "The President and the War," the Express made clear its unwavering support for Lincoln saying, "The country may rely, with unfaltering trust, upon the supreme devotion of the President to the defence of the Government and the suppression of the rebellion. He has never, in a single instance, given the slightest ground for the imputation of being governed by personal ambition, or by any other motive than devotion to the public good." We'll see how these themes develop over the upcoming weeks and if any would be amenable to interpretation at Hopewell. One of the next steps will be to portray a historical persona. Last year, I portrayed Lancasterian William A. Heitshu, who married Mary Geiger, daughter of an iron master with operations in the region. Geigertown, a crossroads two miles west of Hopewell Furnace, was named after their ancestors, and my wife and I pretended to be visiting the village on our respective business and personal matters. The completion of the Reading and Columbia Railroad gave an excuse to talk about pig iron markets and the pig iron supply chain with some of the other reenactors. Like I said, pretending to be historical persons is silly on some level, but it often gives an excuse for a fun train of research questions. We'll see how our impressions develop this year, and I'll try to give an occasional update as I research the issues facing residents of Lancaster, Berks, and Chester Counties in May 1864. Catching up with the 79th Pennsylvania as 1863 turned to 1864, we find them celebrating Christmas and New Years on the summit of Lookout Mountain near Chattanooga, Tennessee. Although the food was more or less limited to sauerkraut and mess pork, the officers of the Lancaster County Regiment were invited to enjoy balls thrown by the 78th Pennsylvania and 21st Wisconsin while the 79th Pa's celebrated regimental band provided the music. In his diary entry for Christmas, Sgt. William T. Clark of Company B recorded, "Tonight there are several balls, a colored one at Gen. Starkweather’s Hd. Qrs. The soldiers on Lookout have won & citizens on Missionary Ridge giving one to soldiers." when we start at 7½ A.M., pass the ruins of C. Station, keep the road over which Bragg retreated. The trail could be easily followed. Broken artillery & wagon wheels, artillery ammunition as well as that for small arms is scattered in profusion along the road. Several unfinished Forts beyond station, also at Graysville a newly graded R.R. intersects the Atlanta Road. Here we take road up creek, march 2 miles to Mrs. Wilson’s house load her things & are returning at 2 P.M. Two cows & calves with colt are the amount of live stock & are brought along. Roads are very bad, heavy mist falling. Mrs. Wilson don’t know where that friend lives to whom she wants to go. When within ½ mile of place let her out to hunt it. We go to camp at 9 P.M., same place as last night. Snowing. Capt. McBride, Sergt. Carr & forty men take wagons, unload them & return when we start for camp on direct road, pass Orchard Knob and arrive at quarters at 2 P.M. to find that John Bowker who had not been sick more that one week had died (Thurs. Jan 7th) this morning at 1 o’ clock at Regimental Hospital & buried this afternoon at 3 P.M. Received letter of Dec. 29th from Cousin Hugh R. Fulton. Sat., Jan. 9th. Morning very cold. No rations today. There will be none untill a boat comes up. ENTERPRISING: A Chattanooga letter writer tells of two members of the 78th Pennsylvania who have taken possession of Lookout summit, erected a shed, hoisted up materials over a couple of ladders, and are now reaping an abundant harvest of greenbacks by taking pictures in this elevated locality. The soldiers crowd here in scores to cut hickory canes and grub the gnarled roots of the laurel for pipes and, attracted by the novelty of the matter, cannot resist the temptation to have a picture of themselves. Accordingly they "strike an attitude" on the extreme verge of a cliff, twenty two hundred feet above the level of the Tennessee, either defiant and warlike or amusing and abstracted, as their genius prompts, and the man of chemicals does them in "melainotype" for three dollars, and sells them a fraim to put it in for five, and all in the short space of about ten minutes. At least one of those pictures -- of Pvt. Henry McCollum, Company B, 78th Pa, and friends -- exists today as part of the Library of Congress's collection. The most pressing issue was their reenlistment as veterans, an issue that the army hoped to resolve during the winter lull rather than at a critical moment in the middle of a campaign. If three-fourths of the regiment reenlisted, the 79th Pennsylvania would continue to exist, and the veterans would receive special "veteran status" (designated by a chevron the sleeve), a bonus, and a 30-day furlough. The initial response was muted, with some other regiments already headed home on furlough before a significant number of men in the 79th Pennsylvania reenlisted. Colonel Hambright addressed the regiment on January 25, and acting regimental commander Capt. Jacob Gompf continued to promote it. By January 27, Clark noted, "Interest on the increase relating to the Veteran Service. 22 members of Co. B upon the list this evening." Despite his father's objections owing to his not being "able to attend to the affairs at home," Clark put his own name on the list on February 5, which then had 233 names. By February 8, the regiment surpassed the three-quarters threshold and was sworn is as veterans. A hard-earned furlough in Lancaster would be in the regiment's future.